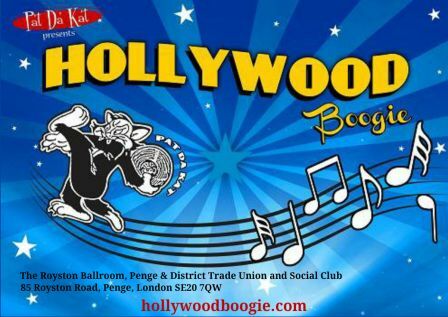 Hollywood Boogie nights featuring music for all the jivers, swing and balboa dancers in South London. Check the News page for more details on each event. The original Hollywood Boogies at The Royston are currently suspended. The venue has changed hands, is under new management and is having a revamp so no more dances upstairs for the foreseeable future. The downstairs bar in the venue has re-opened and rebranded as The Avenue. There are several music nights coming up with different music policies on Fridays and Saturdays. Some nights will be Reggae, Ska and Soul while others will be Jump Jive, Swing and R&B. Check out the Facebook page for upcoming dates and music policies. Regular Hollywood Boogie nights may be on holiday but The Kat is not putting his feet up. You can catch him at several upcoming events. Details on the news page. There is no bar at this Kent venue so bring your own drinks. Free tea, coffee and squash available.